Originating in New Zealand in 1962, the Gala apple is related to the Golden Delicious apple and grows extensively in Washington. The Gala tastes sweet and has a distinctive aroma and crisp, firm texture. 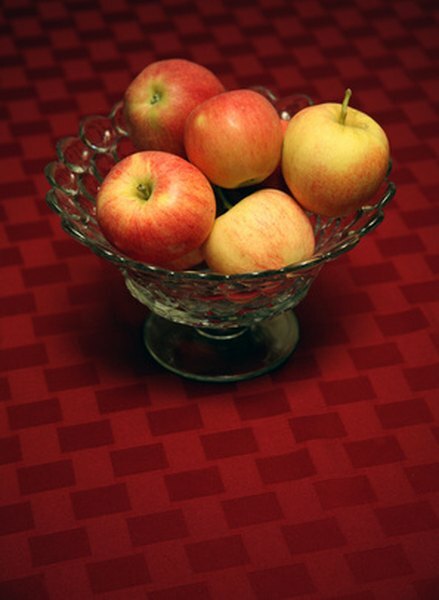 The Gala apple can be yellow with red stripes to nearly solid red in color. One medium apple weighing 5.5 ounces has 80 calories. Antioxidants are chemicals that prevent cell and tissue damage from free radicals in the body by preventing or reducing oxidation. According to the May 12, 2004 issue of "Nutrition Journal," apples and their antioxidants help lower the risk of heart disease, diabetes and cancer. Gala apples are a significant source of these damage-fighting chemicals. Based on a 2,000-calorie-per-day diet, one medium Gala apple will supply you with 8 percent of your recommended daily value of vitamin C. That same little apple will provide you with 2 percent of your daily needs of iron and vitamin A. Also contained in the Gala is 5 percent of the potassium your body needs to be healthy. The natural fiber found in Gala apples is pectin. Apples possess more pectin than any other fruit. A diet high in fiber-rich apples has been shown to reduce blood pressure and prevent colon cancer. Apples are a source of both complex and simple carbohydrates. One medium gala apple supplies 22grams of carbohydrate. Fiber accounts for 5 of the 22 grams. Flavonoids are defensive phytochemicals found in apples. Flavonoids have been documented to have anti-viral, anti-allergic, anti-inflammatory, anti-tumor and antioxidant effects on the body. Research suggests that phytochemicals can protect against the aging process. You can test the apples firmness by holding it in the palm of your hand. The apple should feel solid and heavy, not soft and light. Fresh Gala apples should not have dark or soft spots. When rubbing your finger across the apple skin the skin should not wrinkle. Wrinkling indicates an apple that has not been kept cool enough or that the apple has been kept in cold storage for too long. Gala apples are often eaten fresh. Galas are also delicious in salads, pies, sauces and a number of baked goods. The Gala harvest season runs from October through January. Store the apples as cold as possible in your refrigerator. Gala apples do not freeze until they are below 28.5 degrees Fahrenheit.